Make sauce: In a 5- to 6-qt. pan over medium-high heat, cook onion and garlic in oil, stirring often, until golden, about 5 minutes. Stir in remaining sauce ingredients and bring to a boil. Reduce heat and simmer, stirring occasionally, until thick, 25 to 30 minutes. Measure sauce; you'll need 4 1/2 cups. To reduce, simmer longer; to increase, just add water. Pulse sauce in a food processor into a coarse purée. Meanwhile, preheat oven to 475° and prepare shells and filling: Cook pasta according to package directions until tender. Drain and rinse under cold running water until cool enough to handle. Using a mandoline or vegetable peeler, slice zucchini and carrots very thinly lengthwise. In a large bowl, toss vegetables with marjoram, mozzarella, chickpeas, and pepper. Spread marinara sauce in a 9- by 13-in. baking dish. Generously fill each pasta shell with a scant 1/2 cup vegetable mixture, mounding filling, and set pasta filled-side up in sauce. Cover tightly with foil. 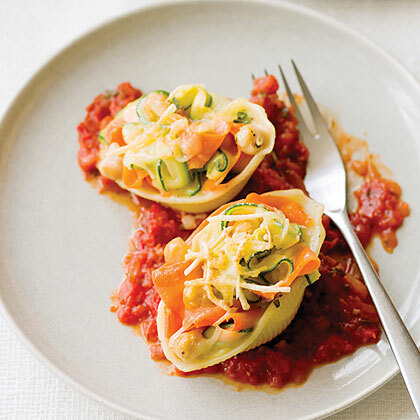 Bake shells until mozzarella melts, 12 to 15 minutes. Uncover, sprinkle with parmesan, and bake until parmesan begins to brown, 10 to 12 minutes more. With a wide spatula, transfer shells and some sauce to plates. Serve with remaining sauce. У нашей компании полезный портал про направление гидроизоляционная мастика.